None of which has much to do with this easy new dish that I put together this evening. It was a half hour in the making: the chicken and veg were done almost exactly when the rice was ready. It has a bit of Asian seasoning, which is a nice change-up from our mostly Latin and Italian flavors. You can spice it up a bit more; just watch the salt if you are using prepared sauces or don’t have low sodium soy sauce! In a large skillet, heat the oil until fragrant. Set the thighs in the oil and brown, about four minutes on each side, lowering heat to medium if things are moving too fast. Remove the thighs and set aside. 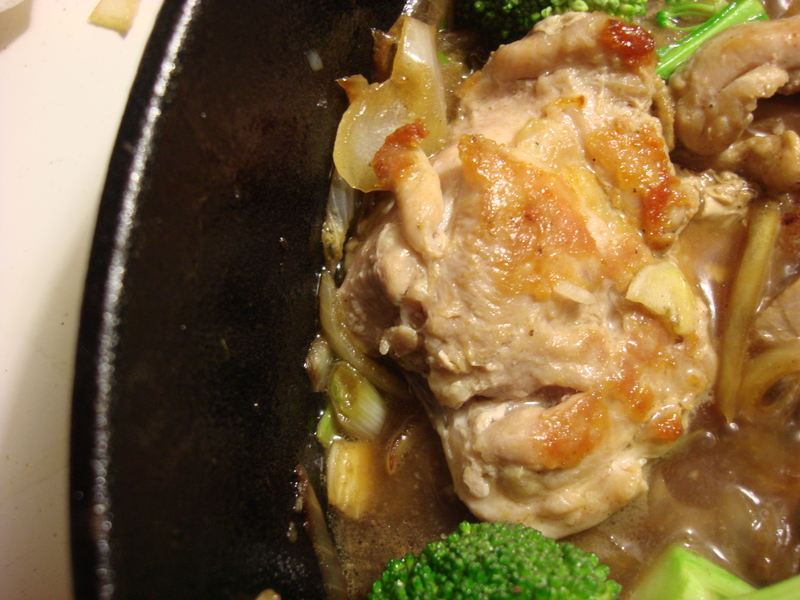 Remove any extra fat in the skillet, leaving about a tablespoon. Heat to high and a splash of rice vinegar or wine to scrape off any nice brown bits. Add sesame oil and onions, turn and lower heat. After a minute, add garlic, scallions and ginger. Cook another minute, then add chili sauce and soy sauce. 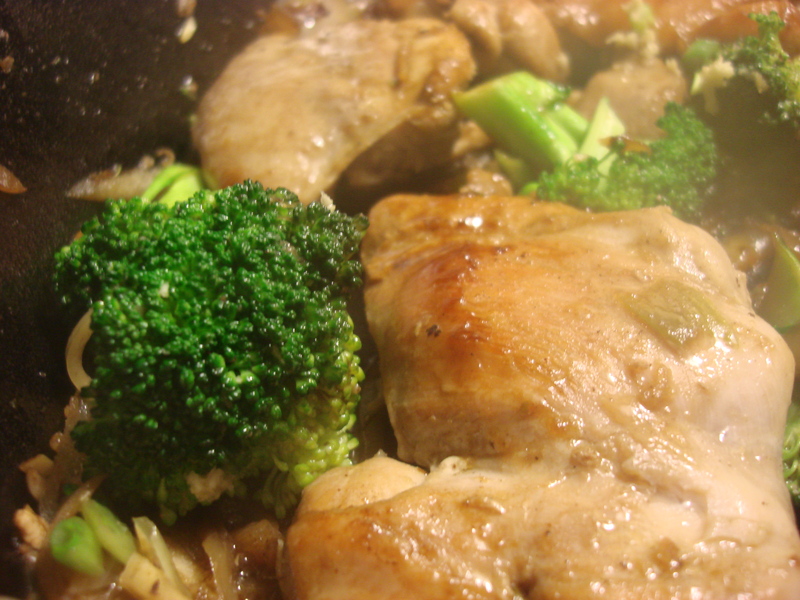 Add ¼ to ½ Cup water, return the thighs to the skillet arrange broccoli around and simmer in the sauce until the water is just about gone and the thighs are cooked through: about 10 minutes (more if the thighs are very thick). 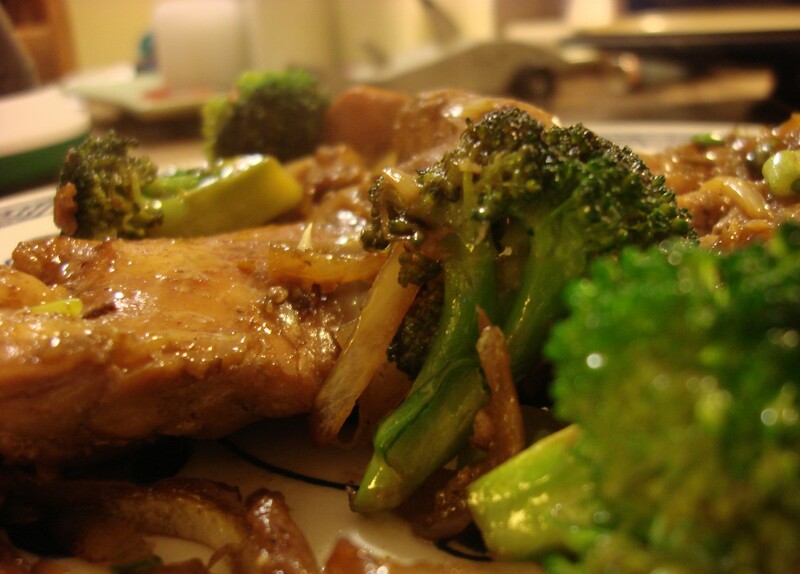 (you may want to deglaze the pan with some wine and buble off the alcohol for extra sauce). Serve with rice. Love the sesame seed idea! love it! This looks so good. I’ll have to give it a try this week!